Brahmanda Puranam has the following incident mentioned with respect to this divya desam. Brahma born out of the nabhi of Narayana was continuing to worship Narayana. One day, God decided to test the depth and sincerity of the prayers of Brahma. He is said to have come to Kadamba vanam, took the form of the Kadamba Viruksham (Tree). When Brahma realized that Narayana was not to be seen, he searched for Him and reached Kadamba vana. He realised the Narayana was one among the Kadamba virukshams. He took some water in his kamandalam, poured it on the kadamba trees. The abhisheka water which flowed over the trees and then colleted in a palce and became a tank. Brahma then repeated the Dwadasakshara mantra. Pleased with the sincerity of Brahmas prayers, Perumal appeared before him. The tank came to be known as Brahma theertham. On the bank of this theertham, later kadamba rishi did severe penance. Narayana appeared before him as wll. The tank, since then, came to be known as Kadamba theertham and the town Kadamba kshetram. It is also said that Siva once commited Brahmahathi by plucking one of Brahma's five heads. Sicne then, the fifth head got stuck to his hand nad tried to get rid of the kapalam. To atone for this sin, Siva visited number of divya kshethrams and eked out his living by begging for alms. Every time he got alms, the bowl will get only half full and so he could not get rid of the sin. He evnetually reached Kadamba kshetra. Perumal asked thaayaar to give some alms to Siva. The grace of Sri was such that the bowl got filled up and Siva was able to atone for his Brahmahathi dosha. It is believed that Siva continued to stay here as Bikshandar. Another story connected to with this kshetram deals with the dharshan given by Perumal to Janaka Maharaja. Once upon a time, Janaka Maharishi, went on a pilgrimage entrusting the kingdom to to the Minister. In course of time he reached the Kadamba theertham. As advised by Gowthamar, he tooks the assistance of Kashyapar and other rishis and performed a yaga. At the end of the yaga, for some reason, they felt the result was not acheived. This upset the Maharishi. During this time, a rishi with his sishyas came along, noticed the plight of Janaka Maharishi, and instructed them to pray to Kadamba viruksham. They did exactly as told and an asareere was heared saying O King! The yaga became infructuous because unknown to you, the havis has been made impure by a wandering dog. Hence the yaga is not able to deliver the expected result. Please prepare fresh homa dravyams and your wishes will be fulfilled. Accordingly the yaga was performed afresh. In answer to the prayers of Janaka Maharishi, Lord Narayana lying down on Adisesha with Brahma on the nabhi kamalam and Siva as Bikshadanar staying by the side appeared before Janaka Maharishi and the other rishis assembled there. Janaka Maharishi is said to have built this temple for the Tirumirthis and installed the idols. It is also said that a King by name Satkirthivarthanan, who has no pregeney, came to this kshetram and offered sincere prayers to Perumal and in the course of time was blessed with a Son. As a thanksgiving measure he built the Udyoga Vimanam with five kalasams on the top, as well as the mandapam and the prakaras in the temple. Besides on Chithiria pournami day he performed an utsavam for Perumal, lived here for a long time and attained moksha. A Sannadhi for Sri Brahma is present here only. This kshetra is also called as Trimurthy sthalam. Direction and Posture Bhujanga Shyanam and East-faced. Access to the temple We have to cross the river Cauvery from Srirangam to reach here. About 1 mile from Sri Rangam and 3 miles from Trichy Junction. The Moolavar of this Sthalam is Purushothaman. He is found in Moolavar in Bujanga seva facing East direction. 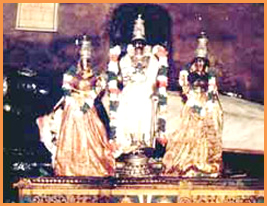 Prathyaksham for Kadhamba Munivar, Thirumangai Alwar, Ubarusaravasoo, the four persons Sanaga, Sanaathana and Sanathkumarar.